Oh, boy! Cat owners beware! 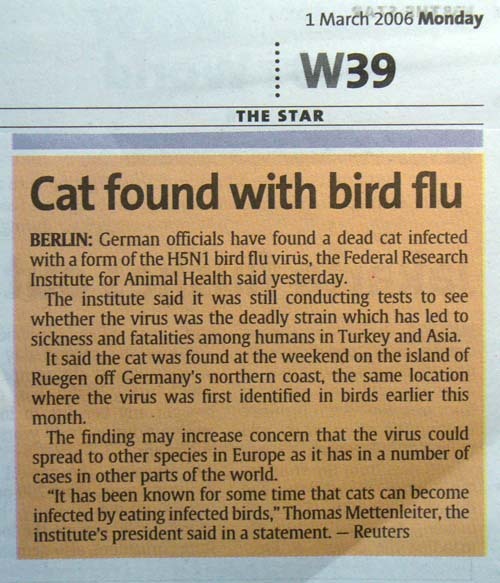 Just recently this news atricle caught my eye, “Cat found with bird flu.” Now that’s a thought. With my pet cat, Casper roaming all over the place I wonder it would be wise to confine him in the house instead. Not easy considering he is such hyper active little fella. Just the night before with the hot weather all around. Casper was very bored and decided that my ankle is good enough target for hunting practice. My wife always commented that Casper always attacks and bites me but never anybody else. Maybe I have spoilt him too much! Well sometimes he spars with me. I guess he needs to hone his self defense skill. Most of the time he gets bullied by other cats and has to turn tail and run. I think that’s good, at least he won’t come back with bleeding bite marks and scratches. Better be a scardy cat than a brave one with injuries. More trouble for me to take him to see the vet to get his antibiotic shots. Now with the bird flu all around, it might be good idea to lock him in the house no matter how bored it gets him, right? 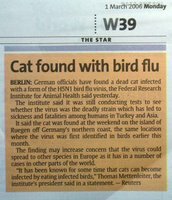 A quick check in the internet revealed that a study was already made in September 2004 that cats can get infected with H5N1 bird flu virus. The cats contracted the bird flu virus after eating infected poultry. The cats also transmitted the disease to other cats. One died within the week when it developed severe pulmonary symptoms during the experiment. With the latest news from released from Germany, cat owners now have to be a bit more wary of where their cats hang out. So far my cat has not been able to catch any birds though he eyes them when the birds flies around the backyard making loud chirping sounds. Hopefully he won’t be able to hone his hunting skill to the extend of catching a bird down on its guard. Looks like I will have to be careful where he roams about.